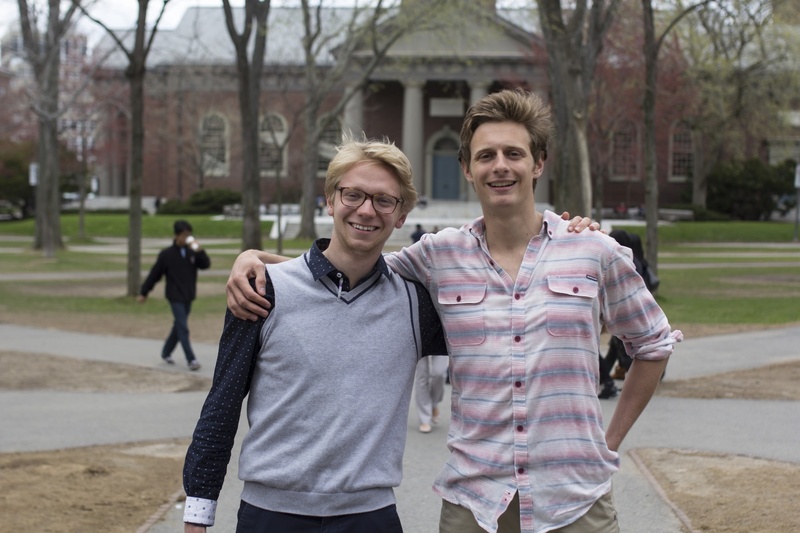 Mark F. Steinbrick ’17, right, and Luke R. Heine ‘17, left, are two of the co-founders of Summer Playbook, a website that enables Ivy League students to meet up with other students that are travelling to the same areas as they are during the summer. Students are creating an online map for Ivy League students to sign up and register their summer locations plans. Summer Playbook—the web-based student initiative that displays Ivy League students' summer locations—is launching its map Friday, hoping to enable roughly 1,500 college students who have signed up to meet and interact with each other. The site officially opened April 14 for students to register their travel plans, but Friday will be the first time that registered students can find fellow students with similar agendas, according to Summer Playbook founder Luke R. Heine ’17. Heine said the initiative began in 2014 as a Google form that he had distributed to Harvard students to help students meet each other as they traveled for that summer. According to Heine, the 2014 form received 800 signups and involved meetups in 36 countries across six continents. After last summer, Mark F. Steinbrick ’17 and Stanford student William Bauer joined Heine in further developing the project. Together, they developed the website and established partnerships at other Ivy League schools. Daniel V. Banks ’17 participated in Summer Playbook last summer, and while in Serbia, two other Harvard students that he did not previously know contacted him. The 2015 Summer Playbook has opened up beyond Harvard, such that any Ivy League college student can sign up. As an organization, Playbook now has student teams at each Ivy League school in order to help integrate the initiative into their local communities, Heine said. Although both the Undergraduate Council and the Harvard Innovation Lab endorsed Summer Playbook, Heine said the site is primarily intended to operate independently from Harvard-affiliated groups. The organization recently filed as an LLC in the state of Delaware.